I offer some initial, tentative observations on MOOCs. 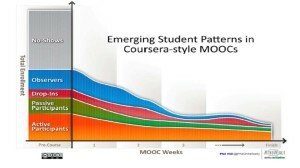 These observations have to do with what might be described as the ‘sociality’ of the MOOC learning environment. These observations are really tangential to my primary micro-ethnographic research question, but I thought they were interesting each to blog about with EDC course peers, and they may ultimately inform my final ethnographic findings. I am now at about the midpoint of my chosen MOOC – Coursera Scandinavian Film & TV Culture. One observation is that there was a flurry of enthusiasm and posting activity early in the course, but it was mostly focused on self-introductions. The “Getting to Know You” Thread is by far the forum with the most posts with: 148 posts, 1748 views. The course organizers encouraged video introductions and I am still reviewing these selectively to assess how the learner’s approached it. But, my initial impression is that many MOOC learners may be just as interested in ‘belonging’ to a kindred ‘community’ of people with similar interests as they are in learning about the course content. The posts, comments, and threads related to the course content continue now in week 3, but the volume is significantly less than the early days of the course. The second most postings were responses to an early thread “What is your favorite Scandinavian Film or TV Series”? which has 126 posts, 719 views. This is a generic question which many learners answered early during the first week of the course, and is still receiving occasional new posts. Subsequent discussion question have received much less attention with generally fewer than about a dozen or so learners engaging in more substantive exchanges based on the course content. A second example of ‘sociality’ in my subject MOOC is that one learner posts concerned wishes for the “peace, safety and continued free speech” to her new Danish friends and colleagues in light of the shootings in Copenhagen this past week. While I certainly share these sentiments for Danish people, it impressed me that the discussion was being used in this case more for as ‘bulletin board’ or ‘chat’ function, rather than focusing on the academic content of the course. Again, I am not judging or critiquing that usage, just observing that the MOOC may serve other ‘sociality’ purposes than learning about the course material.